Jan and Olivia of Joli-Vyann have been showing us their incredible acrobalance techniques this spring. With a style and fluidity of movement giving a strong nod to a history of dance training, and a symbiotic relationship in teaching and performing, we learnt not only how to improve our ability to create and transition between two person balances, but also how to work with balances and performing using multiple people. Posted on March 15, 2017 by Neil Jacob. The Circus House have returned from the Just So festival at Rode Hall. 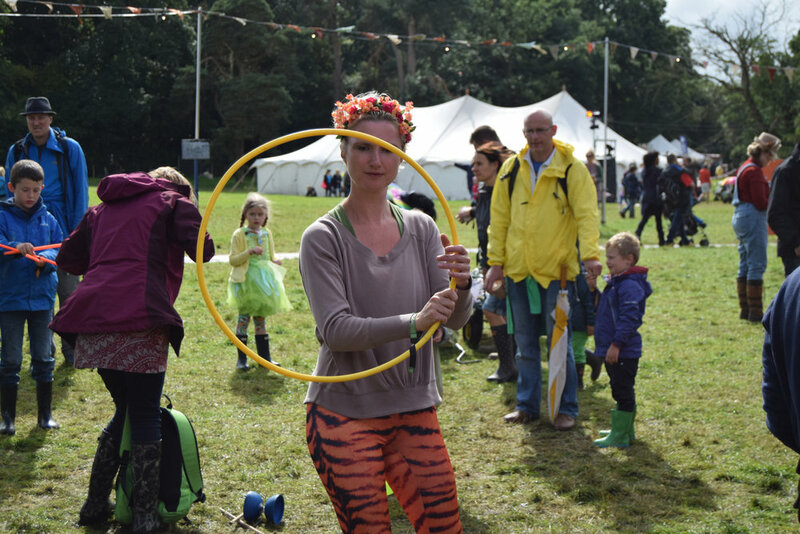 Despite showery spells, a team of teachers and dedicated youth circus members entertained onlookers with their skills and taught children, parents and grandparents a few tricks of their own. Posted on August 24, 2016 by Neil Jacob. Aerial acrobatics has become very popular over the last few years. It's good exercise, it's fun, and it's social. For many people it's also a way to express themselves, and for some people it's a source of income as well. 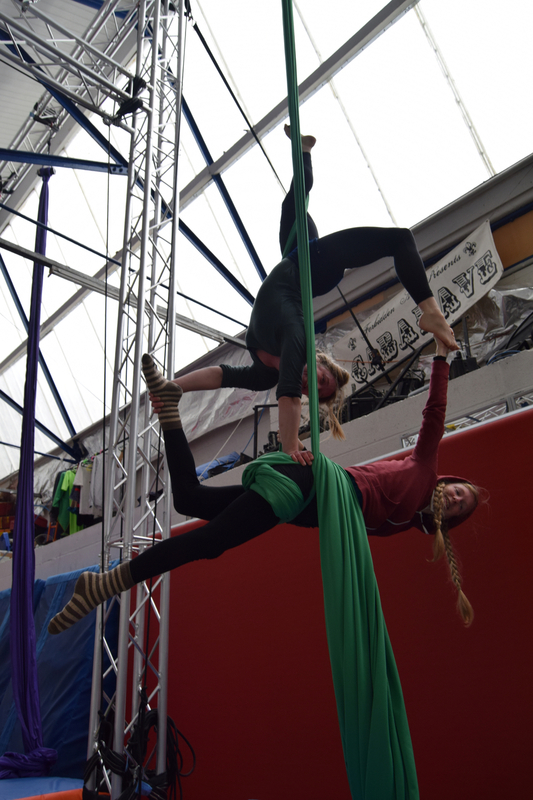 The Circus House' Aerial Development Programme has been set up to offer people a way to broaden their skills, or deepen their knowledge of a particular aerial skill. So far we've had two masterclasses of a series that is being supported by Arts Council England. Each workshop will run for three days. It's a lot of training to do in a short space of time, there's no denying that. However the response to the first two masterclasses has been overwhelmingly positive. You can learn an awful lot in three days. There are only ten spaces available on each course, but keeping the class size small offers a number of benefits. There's plenty of equipment for everyone to use throughout the day, and the guest teacher can really get to know the class. By understanding individual skill levels the course can be tailored so that all members of a class are able to progress significantly. Our first masterclass was with Shaena Brandel of Pirates of the Carabina. Up went the hoops, filling the room with giant metal rings, and then up went the aerialists. Everybody ended up learning tricks they didn't think they'd be doing. We were front balancing on top of the hoops with the bottom of the hoop sandwiched between our feet, and we were dropping from the top of the hoop and catching the bottom of the ring. It was exhilarating. Shaena consistently offered guidance and encouragement seeing us through difficult manoeuvres, and gave really useful feedback when we were back on the ground. The aerial development programme is also a opportunity to learn and develop habits that compliment the lifestyle of an aerialist. Learning to listen to your body and take care of it is always important, but it's especially important if you're hellbent on spending a considerable amount of time suspended metres in the air turning somersaults and wrapping yourself up like a pretzel. The influence of yoga and dance here might not surprise many, but despite training aerial acrobatics for years, the Aerial Development programme was the first time that I was taught to incorporate massage into my training. These kind of benefits make the sessions invaluable. You make connections, exchange nutritional tips, and find out new and better ways to prevent injuries and look after yourself. It's useful to be able to ask these sorts of questions to professionals that have worked as performers and teachers for years. They are treasure troves of knowledge that just isn't available from any book or website. Most importantly, they are more than happy to share what they know. 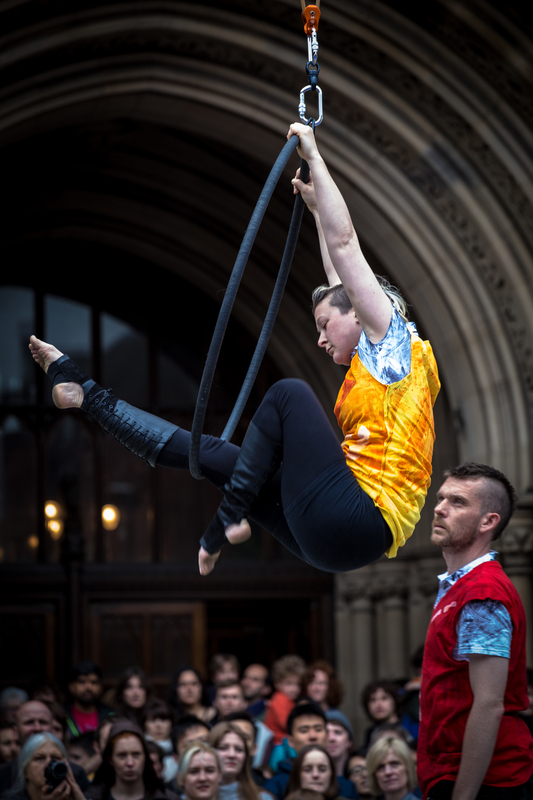 The second masterclass was a Silks workshop run by Claire Crook (Madam Mango) of Greentop Circus in Sheffield. This time a forest of silks was suspended from the rafters. The Circus House was filled with people climbing to the ceiling and entangling themselves in intricate wraps under the direction of Claire. Again, we were able to expand our vocabulary of moves far beyond our initial expectations. We were also given a foundation with which we could explore the silks ourselves and find our own positions and wraps. The workshop culminated in an entertaining series of performances that incorporated what we'd learnt, featuring solo acts, coordinated duets, and even a comedic solo featuring a performer who was only informed of her routine as she performed it. To get a better flavour of what we've been doing, check out the photos above, or sign up for one of the remaining masterclasses! 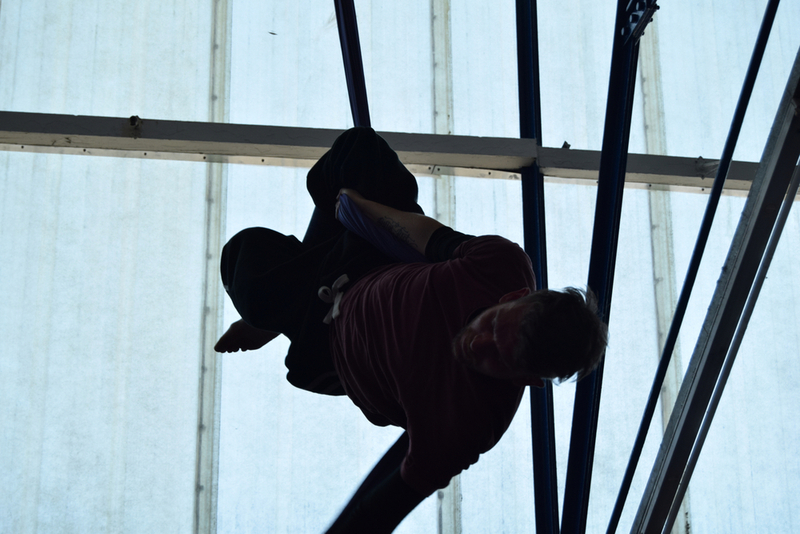 Details of the Aerial Development programme, including the full lineup of classes, is available on our Facebook event page here. You can book onto a course by calling The Circus House on 07428 947 432 or by emailing thecircushouse@gmail.com. Posted on March 10, 2016 by Neil Jacob. Thank-you to everyone that supported and worked with The Circus House this year. 2015 has been a massive year for The Circus House. We’ve seen unprecedented numbers of people come through our doors, some coming from as far as South America or Australia. Working with these travelling talents has allowed us to develop our own knowledge and skills, as well as host masterclasses for our members. Earlier on in the year C!RCA had us walking along each other’s shoulders and standing on each other’s heads! We've also done a little travelling ourselves. The Arts Council helped send our director, Sian, on an expedition to Buenos Aires with her partner Mike. After undergoing an intensive six week crash-course in Chinese pole they brought the know-how back to Longsight so that The Circus House could offer the first Chinese pole lessons in Manchester. The first run of classes, which is suitable for all levels, has just come to an end and will pick up again in the new year. In news a little closer to the ground, we also launched our first tumbling course. Following Owen's completion of an extensive training course in tumbling, The Circus House invested in an air track. The air track allows our members to get the benefit of a spring loaded floor, allowing for higher jumps and softer landings while learning to tumble. 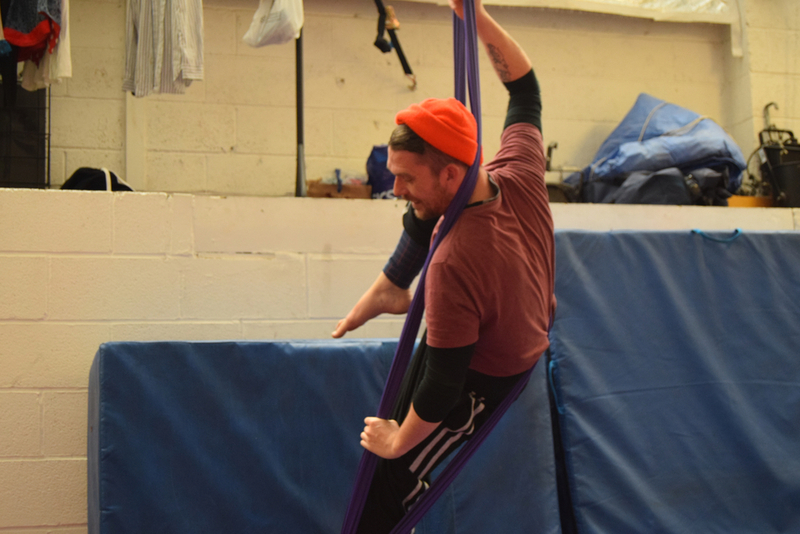 The first set of sessions was incredibly popular, and will return after the holiday on Mondays in the 7.30 - 9pm slot, in rotation with Chinese Pole, Aerial Hoop, Manipulation, and Alex’ Equilibristics class. 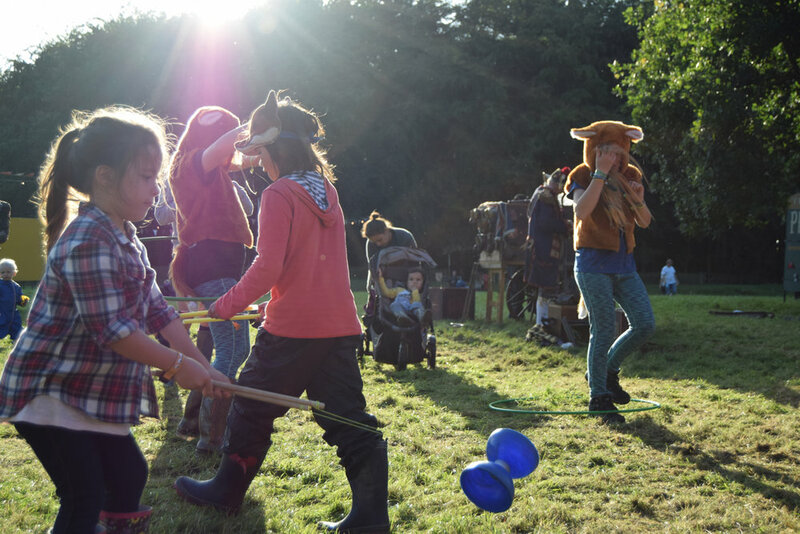 If you’re curious about learning traditional circus skills like unicycling, tightrope walking and stilt walking, Alex’ equilibristics course tackles a different skill each week. Lessons are suitable for all levels and dates will be published in the new year. As well as our new classes, 2015 was also the year The Circus House was invited back to Z-Arts in Hulme. A community of staff, volunteers and members came together to create an original show, Boxed, which we performed for two nights following our sold-out performance last year. The show was well-attended, well-received, and was a fantastic experience for all involved. Check out the photos above. Shortly after the first shows, Boxed was adapted into an outdoor performance. 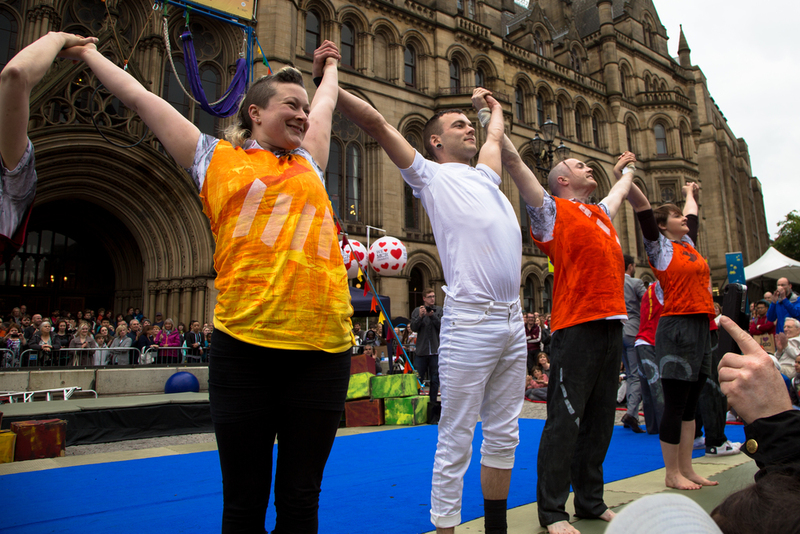 The organisers of Manchester Day flew in director Patrick Nolan to help The Circus House achieve this. As well as adapting the original show, Patrick directed an additional segment to be performed exclusively for Manchester Day. The combination of Patrick’s insightful direction with vibrant set pieces and costumes from Sophie Tyrrell allowed us to deliver one of our best performances yet. 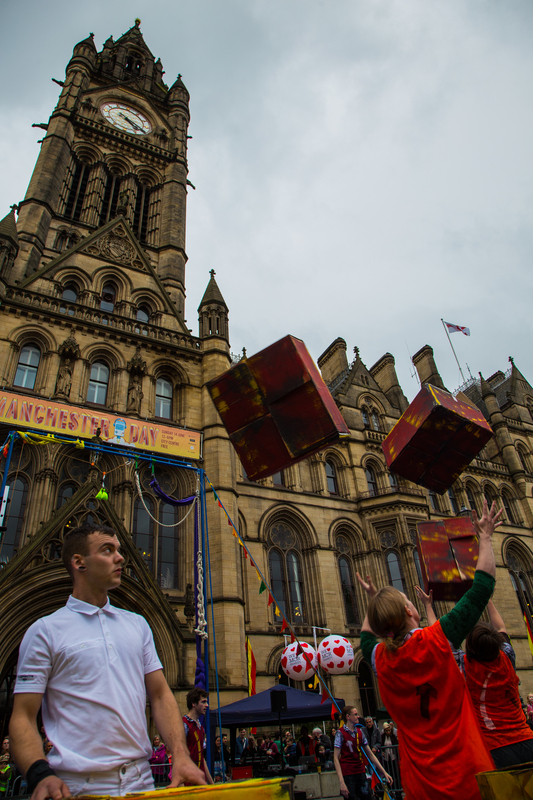 Albert Square was visibly transformed in the run up to each show by crowds of spectators being rounded up into giant games of pass the parcel by unicyclists, stilt walkers and volunteers sporting backpack structures so tall they had to be seen to be believed. 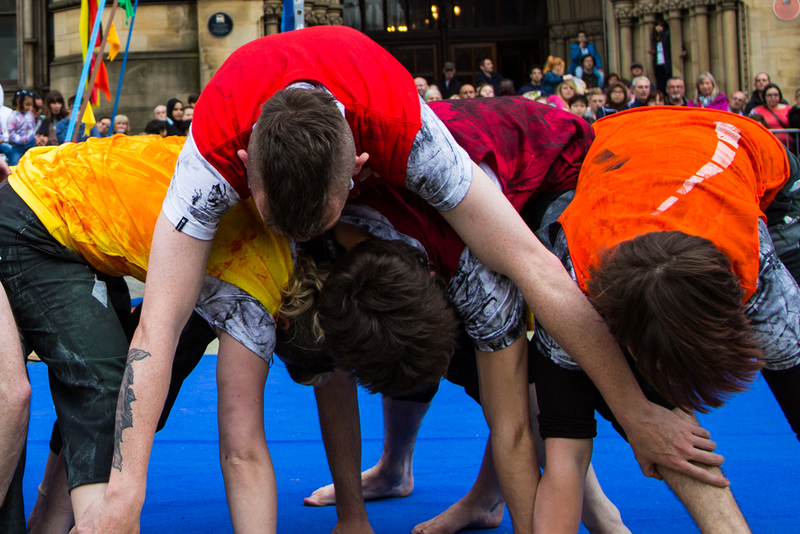 The three segments of Boxed attracted some of the biggest crowds we’d ever performed in front of, and it was an honour. On a more solemn note, we lost a treasured member of staff this year. Jake Williams was an inspiring performer and a dear friend to many. He will be sorely missed, but his dedication and love for life and circus will not be forgotten. It has been amazing to be involved with so many fantastic events and wonderful people this year. We’re impressed with the way the community has grown, and with the imminent arrival of our new aerial rig we’re looking forward to what The Circus House will look like in 2016. The Circus House is closed for the Christmas holidays from December 18th and will reopen in January. Aerial Classes will resume on the 11th. For details of our new classes and masterclasses, sign up to our newsletter. Thank-you, again, all of you. Posted on December 11, 2015 by Neil Jacob. Posted on November 13, 2015 by Neil Jacob. Manchester Day was a huge success and we'd like to extend a wholehearted thank you to every single one of you that came to see us. We've received a fantastic set of photos of the last segment of our show from local photographer Kieran Huscroft and we will be releasing a full set from the day shortly. To see more of Kieran's work please have a look at his website, and please make sure Kieran is appropriately credited if you republish any of his work. Posted on June 19, 2015 by Neil Jacob. Summer is just around the corner in Manchester, shorts are back in the shops, and school kids left, right and centre are pushing through the last six weeks of the school year to get to their big summer break. Meanwhile, on the other side of the city, a 30 strong group of performers as young as ten and as old as a figure we'd rather not discuss have been travelling through the wind and rain over the last two months to create and rehearse their biggest and best community show to date, Boxed. 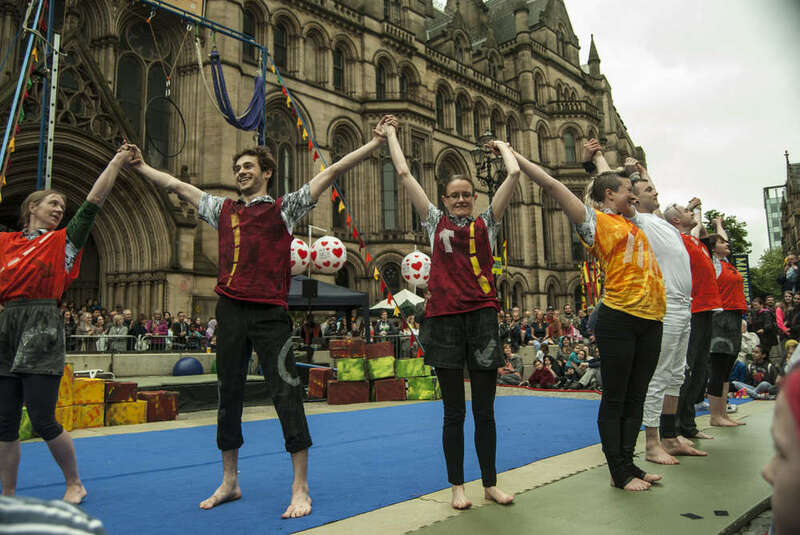 Though you may have missed the debut performance at the Z-Arts venue in May, The Circus House will be performing Boxed to the public for free as part of the Manchester Day celebrations. 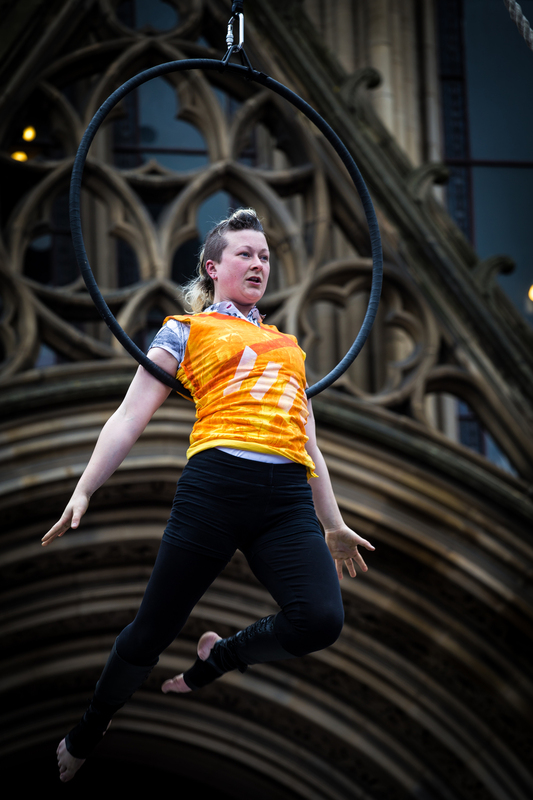 The performance will be split into three twenty minute shows throughout the day and you can bet that the acrobats, unicyclists and jugglers won't be able to keep still in between. 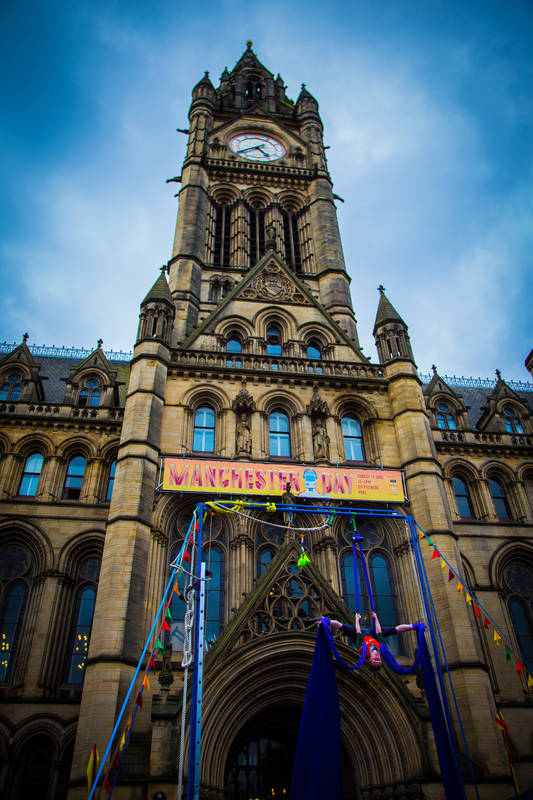 Manchester Day celebrates all the amazing things happening across the great city of Manchester, and The Circus House is proud to be a valuable member of that community. In addition to the original show, acclaimed director Patrick Nolan of Legs on the Wall has been working with The Circus House to adapt Boxed into an outdoor performance. Patrick will also be directing an additional twenty minute segment to be performed in addition to the original show exclusively on Manchester Day. 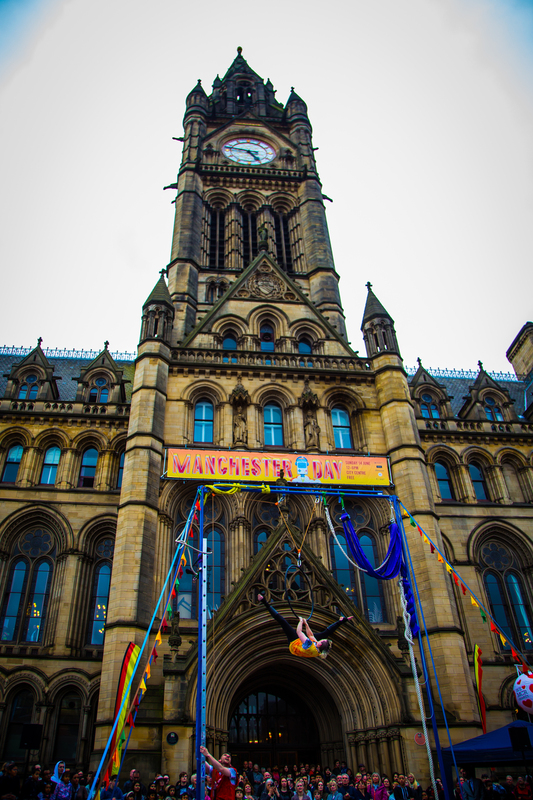 Tens of thousands attended the celebrations last year, which visibly transformed Manchester city centre into an explosion of cultures and communities. It's not one to be missed. 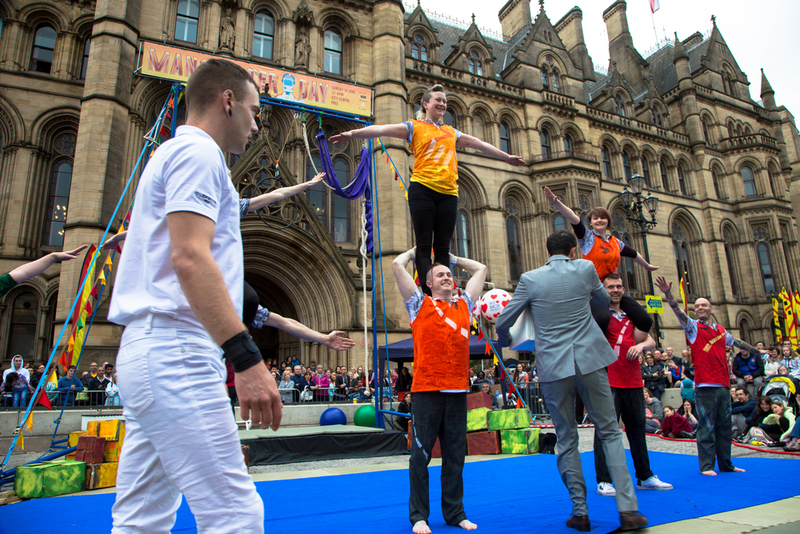 The Circus House will be showcasing their talents for free in front of the town hall in Albert Square from 12-6pm on Sunday 14th of June. For a sneak peek at what's in store, check out the video below. We'll see you there. Have a great day. 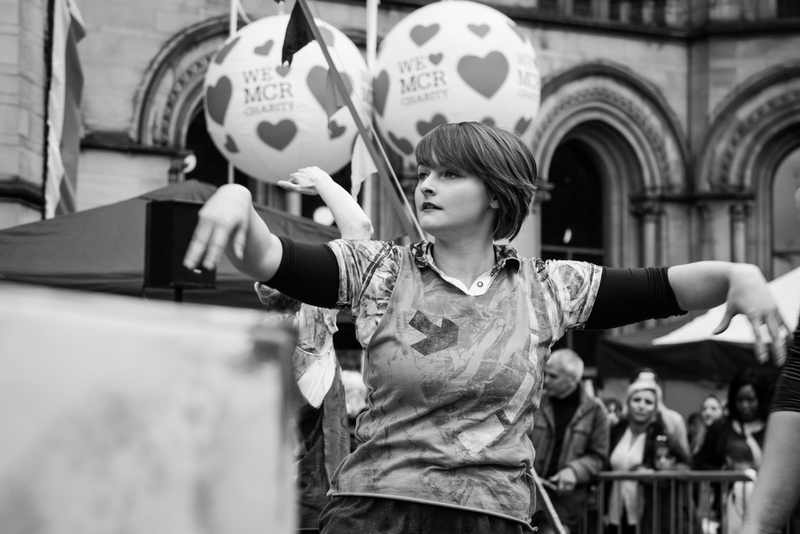 Find out more about Manchester Day and the parade route here. Posted on June 11, 2015 by Neil Jacob. Tickets are now on sale for our latest show BoXED! We all know that the goodies we get online magically turn up on our doorsteps a few days later in cardboard boxes. But what happens from the moment we click 'order' to the moment those boxes land on our doorstep? What happens to the ones that don't arrive? And how do the ones that we get end up getting dented and bashed? Sometimes they turn up looking like someone's been juggling with them! BoXED offers the unique chance to peek into the mysterious lives of boxes. 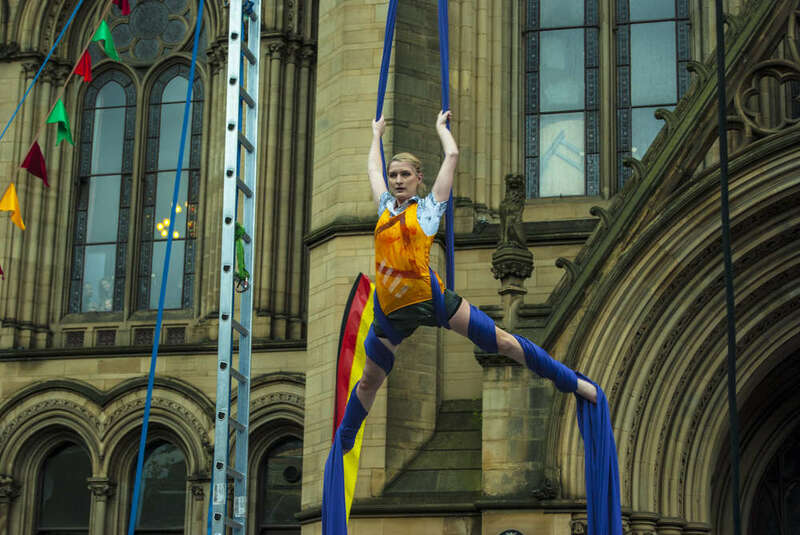 The show will feature dozens of performers from Manchester's community of circus performers, and all the money raised goes back into the circus to provide more opportunities for people through The Circus House. Following our sold-out performance last year, we will perform on two nights at the Z-Arts centre in Hulme. Tickets are available for Friday 15th May and Saturday 16th of May through www.z-arts.org and by calling the box office on 0161 226 1912. Posted on April 21, 2015 by Neil Jacob. 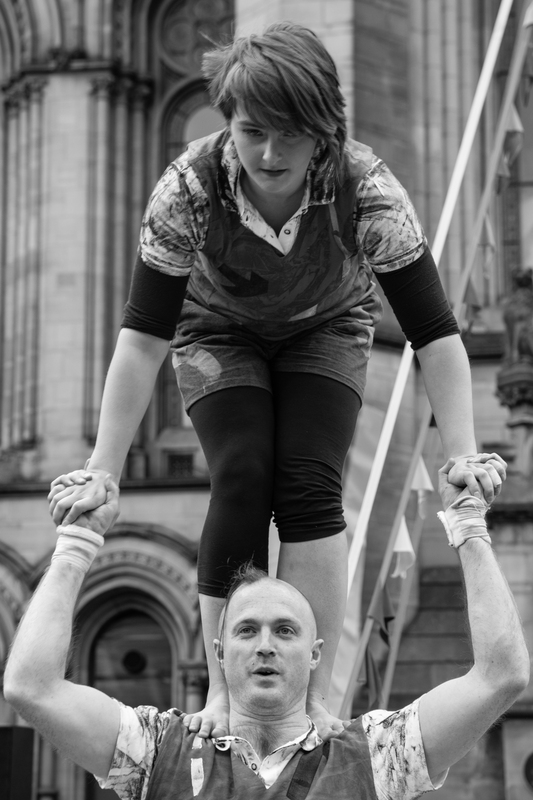 Last weekend, I made a trip up to Edinburgh to take part in the Edinburgh Aerial and Acrobatics Convention, accompanied by fellow Circus House goers, Ellie and Brendan. This is a weekend of workshops and training run by teachers and artists from all over the world. I wasn't sure I would be good enough to get much out of it, but I decided that the experience would be good for me. I'm so glad I went! Even before the convention officially started, I made friends and chatted to people. The atmosphere was really positive, everyone was like-minded and friendly, and eagerly anticipating the weekend's activities. There was a real 'get stuck in' feel, and people were all running around carrying mats and poles and things. Eventually everyone congregated in the large gym for the warm up. It felt a little bit like doing P.E. in school again, except I enjoyed it way more! My first class was aerial hoop, or lyra. This was only the second time I'd ever been on a hoop, but as I generally work on a trapeze, I didn't find it completely different. Second it was intermediate trapeze, and I had a great lesson - I learnt a few new sequences which looked really cool! My third lesson was beginner doubles trapeze. I've not done much doubles before, but I found this lesson really inspired me to want to do more. I learned a few moves which I could bring home and try to work on. It also teaches you not to be shy about getting intimate with people you've just met. After a well needed lunch, it was dance acrobatics - here I found that unfortunately, I am not a dancer and I dont have the coordination for it... legs and arms flailing in the wrong directions - not a good look. Then straight after that it was Russian bar. I actually really enjoyed this, but I was so exhausted after four hours of training that I found it difficult to concentrate. I managed a jump to sit and then from sit, jump up to stand while on a lunge, and I'd like to have another try at some point - when I'm not dead on my feet! After day one I felt like my body had broken; I had aches and bruises everywhere! I genuinely didn't know how I was going to stand another two days of this! The beginning of day two felt even worse, and I didn't have a particularly productive morning. 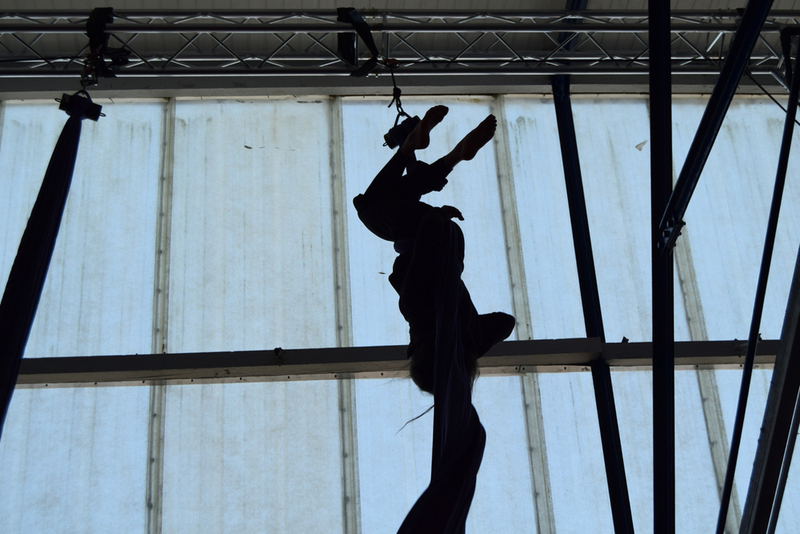 I did try bungee trapeze, but it's surprisingly hard to bounce your way up into the air whilst pulling on a bungee cord! I managed a few rotations, but wasn't really feeling it. I'm glad I tried it though. After that was a beginner rope lesson. Sian always makes us climb the rope or silks in our trapeze classes, so I felt like I was coming to this lesson with a small amount of experience. One of the first things the teacher asked us to do was climb. We also learned a pretty move called amazon on the rope. This is really similar to an amazon on trapeze, except using no arms. We also learned how to get into a hip-lock which I have never learnt to do before! After lunch, I had teeterboard - it was great to try this, just to find out that again, it's not my thing! As a base for teeterboard, you have to be able to co-ordinate your timing and your steps with your partner base, land on the middle of the teeter board at the same time, and then jump together on to the end of the board... yeah, I didn't quite manage that... I jumped on to the middle of the board, hesitated and then tripped and fell face first over the end of the teeterboard... I honestly wish it had been filmed as it must have looked comical. I tried again a few more times, and did get a little better, and I did manage a back somersault as a flyer, but I think I'll leave it to the professionals! I wound down day two with a bit of acrobalance. We built a two layer pyramid, and a three on one! I thought I would feel worse after two days of this, but on day three, I woke up feeling more energised and ready for my final day of training. I think I pushed through some kind of pain barrier and my body just gave up trying to tell me to stop! Day three was exciting, as I got to try two new disciplines: straps and Chinese pole. I really enjoyed both of them! Straps was like trapeze, just with little use of the legs. I did a meathook, which is way harder on the trapeze than it is on the straps! Spinning was so much fun too... I'm tempted to buy a set of straps to play with. After straps, I had Chinese Pole, which was my first class with Ellie! We had a great class, and were both buzzing afterwards. Can't wait to get one of these at The Circus House. After this, both Ellie and I went to intermediate trapeze, (because I enjoyed it so much on Friday!). I finished off the convention with more acro, and a play on the cloud swing, and by the end of it, I was pretty beat. We then had to move all of the mats on to the vans and help pack up some of the equipment. So with a conga line co-ordinated by Brendan, of about 40 people, going from the large gym up the stairs, and into the smaller gym where the mat room was, we passed along about 60 mats which weighed about the same as me - a nice gentle warm down. This trip really made me realise that I am primarily a trapeze artist. It's what I love, and it was probably the highlight of my weekend. It was great to try new things, but I feel way more of a connection to the trapeze, because I've worked on it so much more. I could see myself getting into straps, hoop and doubles trapeze though, and I aim to work on these more between now and EAAC 2015. EAAC 2014 has been an incredible experience. I gained new skills, tried new disciplines, met some wonderful people and acquired some fantastic new body art. Training with different people has been insightful and interesting. It was good to see how different teachers taught things, but also to see the continuity and consistency among the way disciplines are taught and practiced. It's inspired me to create, train and carry on getting better so I can learn even more next year! 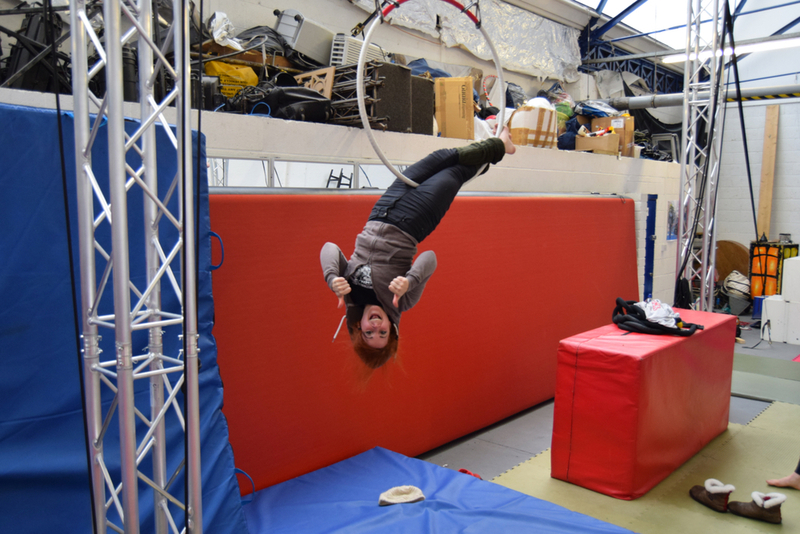 Natalya takes acrobalance and trapeze lessons here at The Circus House, and is one of our volunteers. Posted on September 9, 2014 by Neil Jacob. On the 22nd of May Manchester enjoyed a day like no other in its calendar year. 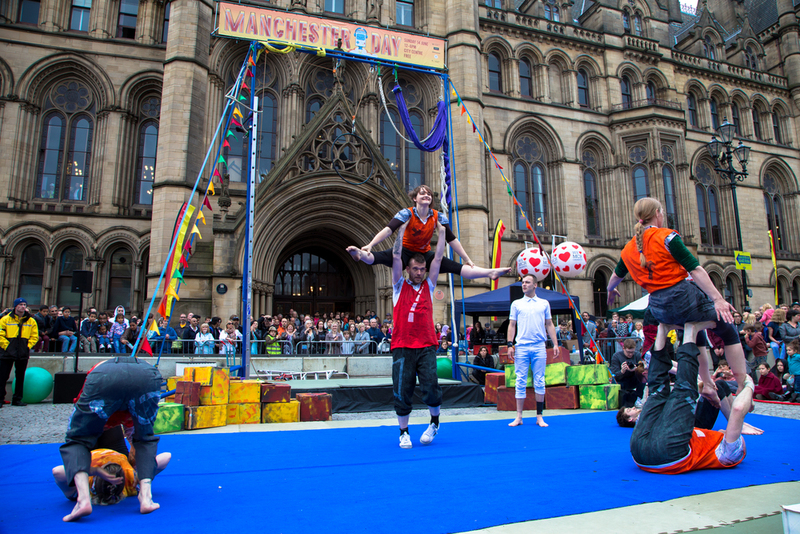 At the peak of summer Manchester’s residents flooded the streets of the city centre to watch the organisations and communities who call Manchester home celebrate their achievements and celebrate their home with spectators for miles around. The parade featured looming sculptures of trains and giant paper maché globes with a rainbows running round their edges. There were foam birds and wicker structures that towering above the spectators, and in the squares along the parade route there were musicians, artists and entertainers situated to entertain in the sun. The Circus House was proud to be a part of the celebrations, setting up camp for the day in front of the town hall as a group of space travellers new to the city. 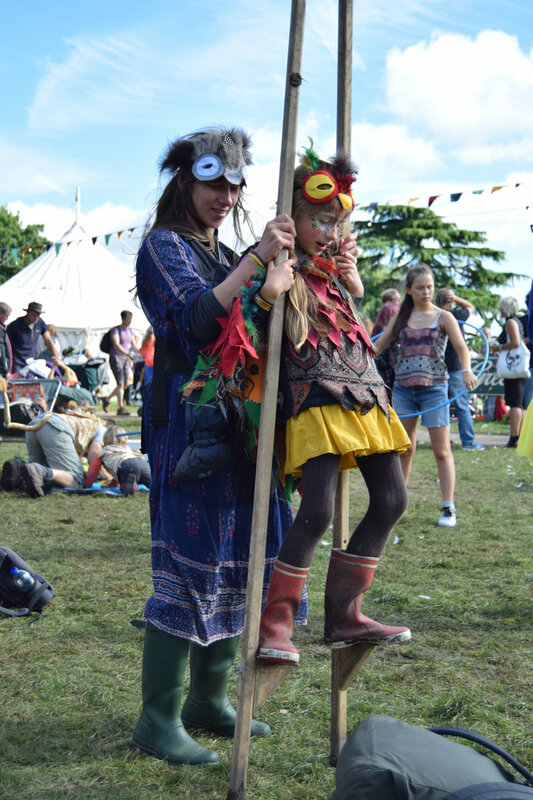 As we receive more photos and videos from the event you will be able to get a glimpse at what a visual treat the day was, not least because The Circus House crew donned their first custom made outfits hand crafted by costume designer Sophie Tyrell. Posted on June 24, 2014 by Neil Jacob. On the 10th of May The Circus House debuted their first public show on the stage at the Z-Arts Centre in Hulme to a sold out audience. 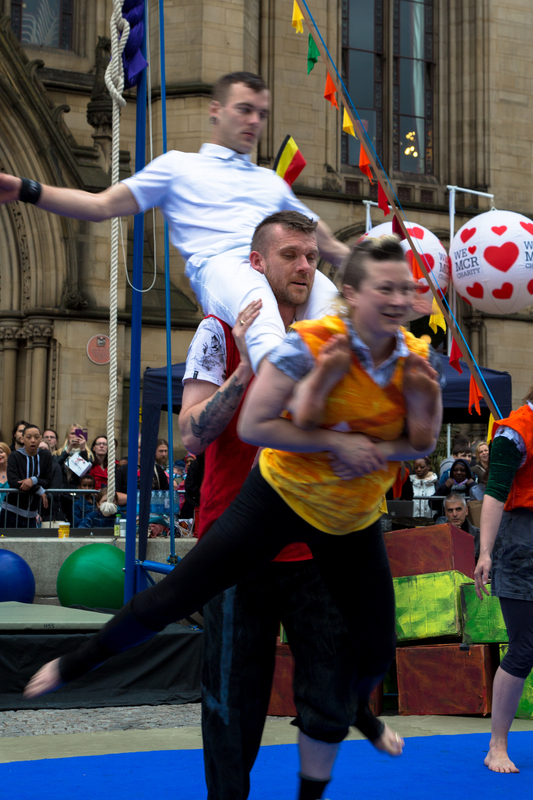 With a cast of over 30 performers, the youngest being just seven years old, this was an exciting night for The Circus House in Manchester. The show included aerial acts on silks and trapeze, balancing acts, people walking around on globes and juggling, and much more. As the videos and pictures come in, we will collect some of them here for people who were unable to make the show. Posted on May 13, 2014 by Neil Jacob.